All Stitched Up Recipes - All Souped Up! For more tham a decade, stitchers have been enjoying All Stitched Up's soup lunches at classes around the UK. Carolyn Dowie and Shelagh Martell are now sharing their delicious recipes, along with many of their beautiful tapestry designs, in their soup recipe book. All Souped Up has over 90 recipes for vegetable, pulses, pasta, game, fish and fowl soups. There is also a section on making different types of bread to accompany the recipes. 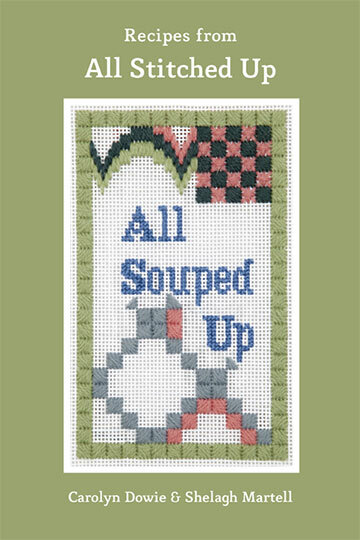 All Souped Up published by All Stitched Up the needlepoint experts and sellers of kits. Apart from making your own delicious soups, the book will make an excellent gift for any occasion. We are offering an option to Buy 2, get the third at half-price - so 3 books for £37.45 + p&p £5.99. Email: carolyn.dowie@btopenworld.com or call 01434 672 389.